Some couples plan their pre-wedding shoots overseas. But, why do you need to go abroad if you can have pre-wedding photo shoots in this beautiful country? Indonesia’s splendid landscape, breathtaking beaches, and amazing nature make a great pre-wedding photo shoot locations. Bali has been one of the most favorite locations to have pre-wedding shoots (and the wedding itself). Other than the Island of the Gods, Indonesia always has many beautiful backdrops for your lively shoots. Here are a few great places to check out! The backdrop of Kawah Putih is white-bluish crater lake, white sand, hills, and sometimes fogs which are the reasons why Kawah Putih is one of the favorite pre-wedding shoot locations in Bandung. It is a really good match for romantic or dramatic photo shoot concepts. This site is open every day for visitors as well as for pre-wedding photo shoots. 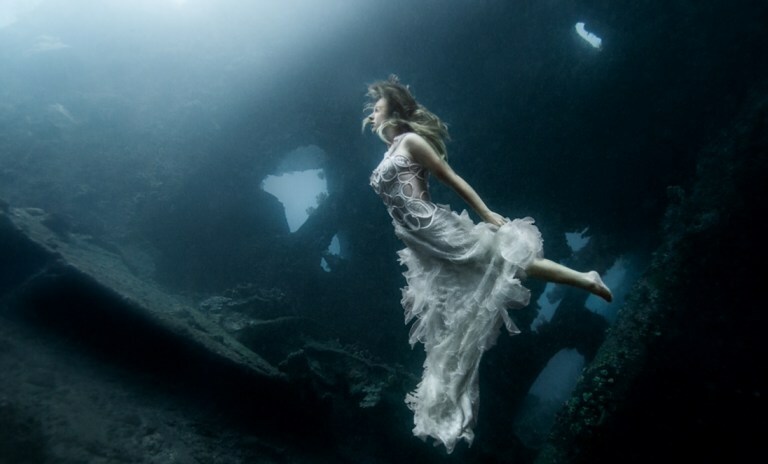 If underwater photo shoot is your concept, you can consider Tulamben Shipwreck as the location. This is actually a shipwreck from the World War II era. Rather than spooky, the rustic shipwreck offers beautiful background for your pre-wedding shoot. Make sure you and your photographer team has a good physical condition because having a shoot here means twice the effort. Having your pre-wedding shot on the top of the world is possible. No need to climb Mount Everest to make it comes true—you can do it at Mount Bromo. Endless blue sky combined with the smoke from the crater will surely provide a beautiful set for your pre-wedding photo shoot. You can do the shoot a few moments after sunrise as the light will be so dramatic and mesmerizing. Padar is a small island located between Komodo and Rinca islands within Komodo archipelago, East Nusa Tenggara. 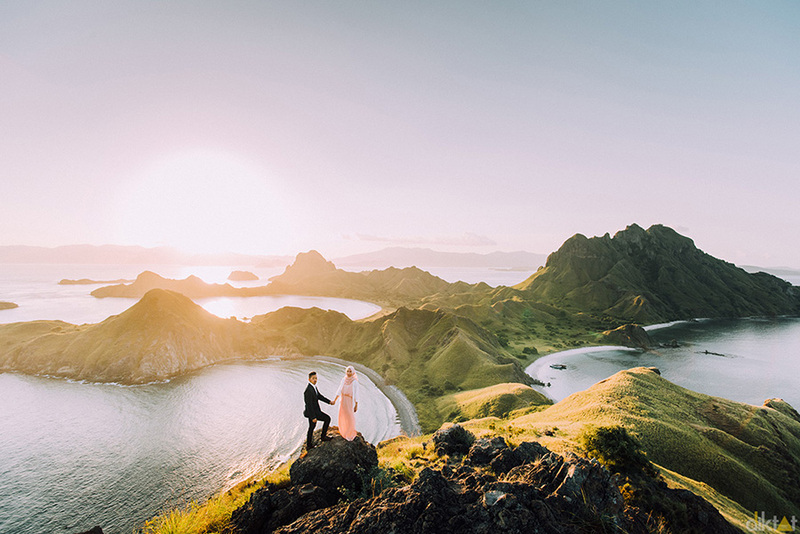 The hills of Padar Island are perfect for adventurous couples who want some extraordinary shoots. Hike halfway up to the summit of the hill to get the most beautiful background you can see here: the three beautiful beaches. A journey to Padar Island won’t be easy, but it will worth the effort. No need to go to Saharan Desert for your pre-wedding shoot. 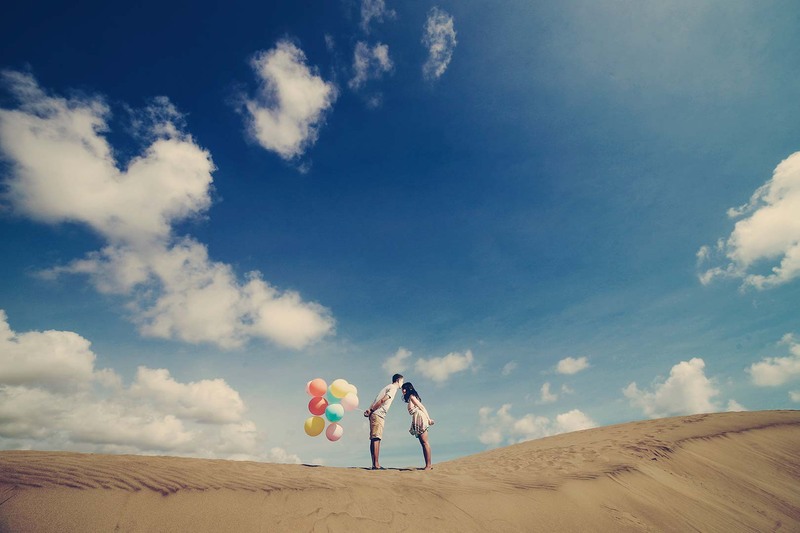 Gumuk Pasir Parangkusumo is not only for sandboarders, it also could be a fantastic pre-wedding photo location. This location is best for casual photo shoot concepts. If you have limited budget yet want a fantastic photo background, you should consider this place. Mount Papandayan has a dead forest that could be a one-f-a-kind photo background for your pre-wedding shoots. It’s only trunks and branch of the trees without leaves, standing on top of chalky white soil. When the fog envelopes the forest, it would be a great background for a romantic-mystical photo concept. This location is also friendly for beginner hikers. Are you aiming for a vintage photo shoot concept? If the answer is yes, no need to go further. 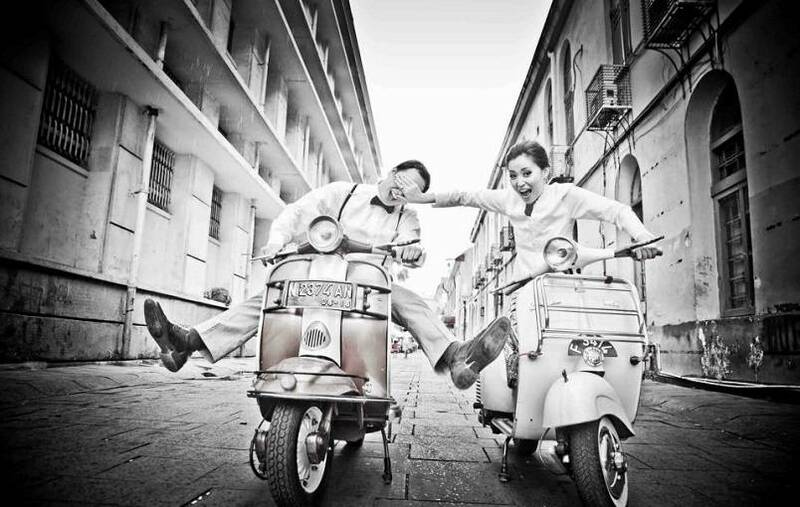 Kota Tua, especially around Fatahillah Square, has been always a great location for any concepts of photo shoots. The architecture of the buildings around it remains the same like it was decades ago and creates a perfect set for vintage pre-wedding shoots. Other location options around Kota Tua are Pelabuhan Sunda Kelapa, Jembatan Kota Intan, Toko Merah, and Café Batavia. Nothing beats the beauty of flowers. At Taman Bunga Nusantara, you can capture your pre-wedding session and the mesmerizing flower garden in one frame. This flower park offers endless beautiful spots for your photo shoot. Several favorite spots are Taman Perancis, Taman Rahasia (Labyrinth), and Taman Mawar.